What would make Israeli Prime Minister Benjamin Netanyahu want to hand over Mount Zion and the Tomb of David to the Vatican? One member of the Knesset has publicly stated that Chief Sephardic Rabbi Yitzchak Yosef has informed him that Netanyahu has formally asked for halakhic permission to give the Tomb of David to the Roman Catholic Church. And there have been persistent rumors of secret negotiations between the Israeli government and the Vatican regarding Mount Zion and the Tomb of David. So why would Netanyahu want to do such a thing? In any peace deal with the Palestinians, the Tomb of David and the Mount Zion complex should remain under Israeli control. So what is Netanyahu thinking? A Knesset Member said Thursday that Chief Sephardic Rabbi Yitzchak Yosef told him that the Prime Minister’s bureau contacted him and asked to grant halakhic permission for Israel to hand over the Tomb of David to the Vatican. If the Vatican does gain control of more of the holy sites in Jerusalem, it would move even farther in the direction of being regarded as “the top religious authority in the world”. This certainly would not bother Pope Francis. In fact, he seems to be quite eager to do what he can to bring the religions of the world together. For much more on this, please see my previous article entitled “Pope Francis And The Emerging One World Religion“. 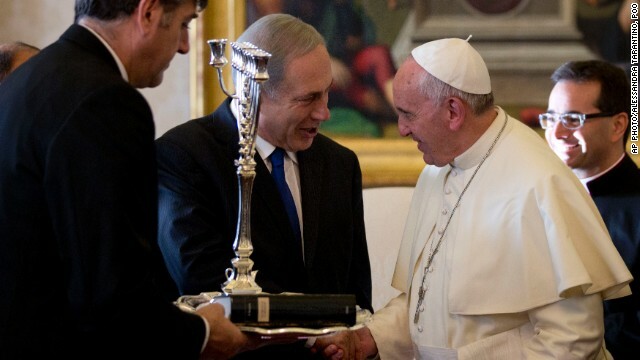 These secret negotiations between the Israeli government and the Vatican could also be an indication that peace talks between the Israelis and the Palestinians are not dead. Netanyahu talks tough, but he has also publicly stated that he is “prepared to make historic peace with our Palestinian neighbors“. According to the report, Kerry’s use of the loaded term is already rankling Jewish leaders in America. After making such a comment, Kerry should have been immediately forced to resign, but of course that did not happen. American officials directly involved in the failed Israeli-Palestinian peace process over the last nine months gave a leading Israeli columnist a withering assessment of Prime Minister Benjamin Netanyahu’s handling of the negotiations, indicated that Palestinian Authority President Mahmoud Abbas has completely given up on the prospect of a negotiated solution, and warned Israel that the Palestinians will achieve statehood come what may — either via international organizations or through violence. Speaking on condition of anonymity to Nahum Barnea, a prominent columnist from Israel’s best-selling daily Yedioth Aharonoth, the officials highlighted Netanyahu’s ongoing settlement construction as the issue “largely to blame” for the failure of Secretary of State John Kerry’s July 2013-April 2014 effort to broker a permanent peace accord. But for any peace agreement to work, it isn’t just the Palestinian Authority that Israel has to deal with. Hamas will never recognise Israel and will not accept the conditions laid out by the Middle East peacemaking Quartet, according to the Islamist movement’s deputy leader. Speaking late on Saturday, Mussa Abu Marzuq said Hamas, which recently signed a reconciliation deal with the Western-backed Palestinian leadership in the occupied West Bank, would never agree to recognise Israel. “We will not recognise the Zionist entity,” he said at a press conference in Gaza City. Could he have been any clearer? The truth is that peace with Israel is absolutely antithetical to everything that Hamas stands for. Sure, we will probably see a U.S.-brokered peace deal within the next year or two. But it won’t bring lasting peace. Instead, it will just set the stage for the next major war in the Middle East.